Those regular Harrietville festival goers will remember James King and his talented band’s visit here in 2004. Julie King (James’ wife) has just advised that James King will be out of commission for a while as he battles Deep Vein Thrombosis. James is currently under the care of a vascular surgeon with his left leg is blocked from his groin to his ankle with collapsed veins. Julie has called on the bluegrass community to pray for James’ recovery. James was well enough this afternoon for me to check him out of the hospital. He is still being treated for Acute Deep Vein Thrombosis in addition to gall stones and now with some liver issues. He is home adhering to doctors orders of strict bed rest with no cell phone calls for a few days. .
We have received news this week of James King’s recuperation. He was hospitalised due to a number of blood clots in his lungs and his legs. Julie King has told of Jame’s release from the hospital last Friday evening. James is currently on numerous blood thinners, and a very strict diet, managing to keep the fever away. Prayer definitely works. I printed and/or read every message sent to him the last few days. For James, that was the best medicine. Once again, thanks to all who sent well wishes, and hopefully he’ll be back on stage, at least for a part-time schedule soon – Julie King. Australian bluegrass fans will remember James King and his band who traveled to Australia in 2004. We have news from the USA this morning that James has been admitted to the Danville Regional Medical Centre yesterday with blood clots in his lungs and leg. He may be in the hospital until the clots have dissolved and his blood flow returns to normal. Anyone wishing toÂ to send get-well-soon cards or wishes are welcome to do so, via Post Office Box 10179 in Danville, Virginia 24543, or via this blog. Send emails via this link and we’ll forward them on. His condition is stable atÂ this point, but still very serious.Â He is not taking phone calls, nor visitors until the infection and clottingÂ subsides. I willÂ appreciate everyone’s thoughts, prayers, and concerns during his recovery.Â Thank you and we will see youÂ all down the road. P.S.Â I did get him into aÂ ‘Bed By the Window’ – Julie King. James King and his band have announced a new website featuring band bios and merchandise pages. 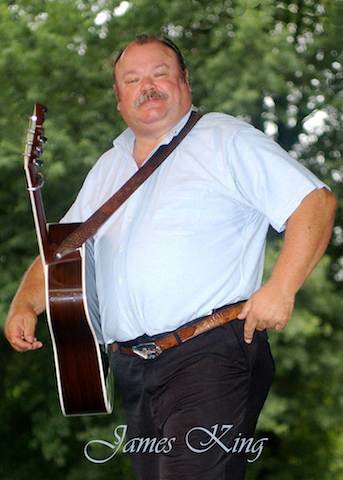 James King was born Sept. 9, 1958, in Martinsville, Virginia, and grew up in Carroll County, one of thof the most fertile breeding grounds for bluegrass and old-time musicians. James is known as The Bluegrass Storyteller. His most moving recordings being songs such as Echo Mountain, and Bed by the Window. The James King Band features a different lineup to those who visited Australia a few years ago. They are apart form James himself, Ron Spears onÂ mandolin and tenor vocals, Greg Moore onÂ fiddle and vocals and Tony Mabe on banjo and vocals.